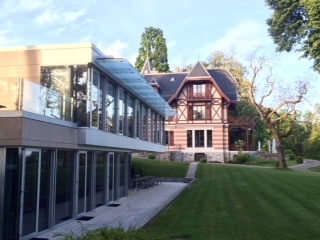 Brocher Foundation Institute, Hermance, Switzerland, May 18-20, 2016. This report is the combined effort of three members of the organizing team. Our aim is to summarize the key themes and new questions that we came away with from the workshop, both as a follow-up for participants who joined us at Brocher, and as feedback for our colleagues in South Africa who attended the pre-Brocher workshop at Stellenbosch University. This report is largely a reflection of how the three authors experienced the workshop and is not intended to be a neutral overview. Here we organize our thoughts according to the second half of our workshop title: rationale, trends, obstacles and ways forward. We begin with an overview! 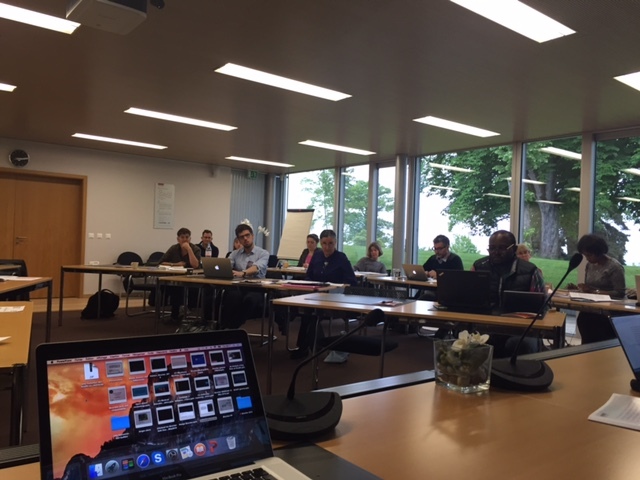 The workshop was held over three days at the beautiful Brocher Foundation domain on the banks of Lake Geneva, Hermance, Switzerland. Participants were invited to attend on the basis of the organizing team’s awareness of their work in the area of integrating the social sciences and humanities into health professions education, as well as through recommendation. We were a total of 25 people including 21 presenters and 3 rapporteurs. For bios and abstracts of presenters and rapporteurs: CLICK HERE. Each of the three days of the workshop was organized around a central theme (see Programme HERE). We started off on Day 1 in the realm of experience and heard a number of case studies of health sciences curricula in practice. On day two we began moving from the realm of practice towards contemplating the theory behind the trend to include social science and humanities in health sciences education. On day three we heard from Vinh-Kim Nguyen before various participants hosted ‘open space’ sessions. The ‘Open Space’ session was a chance for participants to engage in additional discussion around topics of particular resonance, or topics which deserved more attention than we had been able to give them in the previous two days. These included decolonizing curriculum, violence and conflict medicine, planning a meeting at the next EASA conference, balancing the demands of working in health science education with developing professionally in one’s discipline, and the messiness of ethics. We ended day three with brainstorming ideas of how to move forward, and how to put to paper some of our emergent ideas. The call for the humanization of the health sciences has emerged as a challenge to the reductionist turn that health care practice has taken. Iona Heath’s presentation demonstrated the short falls of the reductionist paradigm currently existing in health care practice through her presentations on the chasm of theory and practice, between disease and the patients experience of illness, the body as object and subject, between utilitarian and deontology, and between normative and descriptive. In the case of South Africa, it is clear that the ideal health professional ‘fit for purpose’, and ready to deliver health services as proposed by Health Plan 2030, needs to use their hearts and their heads to bridge the different chasms between theory and practice, between disease and the patients experience of illness and lastly between the body as object that needs fixing and the person as subject of our care and intervention focus. In coming together at this workshop we collectively agreed that the education of health professionals is one inlet into bridging the ‘chasm’ in (future) healthcare. However, it is also not the only one. Jane Macnaughton, early in the workshop, raised the question of whether the goal of the humanization of health sciences can be achieved through education, or whether research is a more productive avenue. While a lot of effort can be put into the content of such curricula, does the content matter as much as we think it does? When the content is wrong –i.e. when the social and cultural context of illness for example falls into the trap of promoting stereotyping of patients, and reductionism, the aware student will feel cheated (Caroline Hodge’s presentation described this beautifully). When the content of the course does not prepare students for the reality of the healthcare contexts they work in, whether in Montreal or Cape Town, the content can also be called into question (Mathieu Isabelle and Michelle Pentecost and Thomas Cousins’ presentations illustrated this). But will content ever suffice, even if it is the ‘right’ content? Can we expect medical students to passively learn what an ethnographer like Todd Meyers came to understand about ‘the social’ through years of engagement with a woman living with multiple chronic conditions and her family? If students cannot do the ethnography perhaps reading it is the next best thing. However, as Megan Wainwright argued, the struggle of integrating the social sciences and humanities in health sciences education parallels the struggle to publish the evidence from these disciplines for medical audiences. A culture change related to hierarchies of knowledge which goes beyond the realm of education, is clearly needed. From the start of the workshop, there was also an agreement to disagree about the centrality or appropriateness of the concept ‘humanization’. Many, including some among us organizers, are weary of the term. For instance, the association of ‘being human’ with being a kind, respectful and attentive health professional denies the fact that to be rude, disrespectful, and neglecting are also undeniably human traits. As emerged in our pre-Brocher workshop in South Africa at Stellenbosch University in March 2016, humanization has tended to evoke issues that lie at the heart of interpersonal interaction, and miss out on wider political and economic factors. This is despite the fact that there is nothing inherently ‘a-political’ about ‘humanization’. A number of presenters, especially speaking from their experience of studying for health science professions, expressed the rationale for including social sciences and humanities in wider terms – i.e. to create space for intellectual and creative thinking amid a curriculum weighed-down with rote-learning. As Mathieu Isabel put it, social science classes can be “An eye opener to some, a dreadful experience to a few or a real intellectual salvation to others”. While more recently in South Africa such discussions have emerged under a general umbrella of medical and health humanities, Rolf Alhzen’s talk was an excellent reminder of the historical context of the ‘medical humanities’. Similar answers to the issue of de-humanized healthcare included ‘practical humanism’, ‘principled ethics’, and ‘narrative medicine’ to name just a few. Still, most examples of integrating the humanities and social sciences take the form of an ‘added’ facet, lecture, course, or strand. We heard from many at the cutting-edge of this effort. For example, we heard from Carla Tsampiras about the evolution of a new strand in the second and third-year medical curricula entitled ‘Critical Health Humanities’ at the University of Cape Town. We heard from Simon Forrest about the work of the UK network of Behavioural and Social Scientists Teaching in medicine (BeSST) in creating a core curriculum in Medical Sociology available in the form of a guideline that is freely accessible. We heard the successes of a programme at the University of Newcastle (Australia) aimed at attracting and supporting aboriginal medical students from Jill Gordon. Berna Gerber explained how she draws on academic philosophy in her clinical communication course at the University of Stellenbosch, and Ike Anya how his background as both a public health physician and a writer, come to bear in his teaching of medical ethics in the UK and Nigeria. Seth Holmes presented the work he is doing with colleagues on developing the notion of ‘structural competency’ as an assessment measure of medical students with a direct relation to students’ understanding of the social and political contexts of health and illness. Mathieu Isabel shared how some of his greatest moments of learning in this area came from observing interdisciplinary meetings that included patients, and in doing so reminded us of the importance of experiential learning and role-modelling. A re-occurring obstacle to achieving the integration of the social sciences and humanities in health science curricula, whether in an additive or integrated form, was the marginality of the social sciences and humanities as they currently stand within medical and health science curricula. At times our discussions certainly felt a bit like a support group as we shared and empathized with each other about the difficulties inherent to teaching the ‘marginalized’ curriculum (this came through in Megan Wainwright, Carla Tsampiras and Anita Berlin’s reflections). From dismissive colleagues, to highly stressed students who may experience the social sciences and humanities as a distraction away from the ‘true’ ‘science’ of doctoring, the lecturers of the social sciences are on the front lines, and some are starting to ask, “is this worth it?” There was concern raised about applying one’s disciplinary skills to the project of teaching future health professionals. One concern was the loss of a disciplinary identity and intellectual growth within one’s discipline. This topic was of such pertinence that it became its own topic of discussion during the Open Space time on the last day (led by Carla Tsampiras and Seth Holmes). Caroline Hodge outlined the “Social and Behavioural Sciences” curriculum at her institution and gave a powerful student-perspective on the marginality of this content vis-à-vis the rest of the curriculum. At the same time we collectively empathized with medical and health sciences students in over-charged, competitive, exhausting training over which they have very little control or choice. This was made all the more real by the contributions of current and recent medical students (Mathieu Isabelle, Anke Maatz, Caroline Hodge, Guddi Singh, Michelle Pentecost). On the flip side we heard a number of positive teaching and learning experiences and an overall attitude of resilience towards these challenges. After all, for many of us, it is extremely satisfying and motivating to contribute to the wave of changing mindsets in medical and health sciences education. From hearing these positive experiences we could re-energize our efforts and share a host of effective classroom techniques including teaching through ethnographic stories (Vinh-Kim Nguyen), through philosophy (Berna Gerber), through feeding research findings into teaching (Lizahn Cloete), and through creative scenarios (Catherine Belling). Particularly thought provoking were the positive experiences of elective and even student-run courses in philosophy (Anke Maatz) and medical anthropology (Caroline Hodge), that open up a different space to work in. These contributions raise the question of whether working in the realm of the ‘elective curriculum’ is a way of embracing ‘marginality’ and making it productive. In dropping our claim that social science and humanities are ‘essential’ to health professionals training, perhaps we can both work more positively with those who are actually interested, and do away with the frustration of poor attendance and an overload of poorly written assignments. As mentioned we also empathised with students for the lack of choices they have in their careers as health science students, and electives could open-up more choice. This did not change our sense that the knowledge of the social sciences and humanities is equally important to the knowledge from the sciences, but raised the possibility of approaching the struggle for this recognition in a different way. Important questions to take forward include: How could health professionals be trained to be more critical? (Iona Heath). How should health professionals be trained to assume an authentic professional identify, yet still retain their own sense of self? (Michelle Pentecost and Thomas Cousins; Mathieu Isabel). In an attempt to answer these questions, it may be of great value to consider who has the capacity to influence the change that is needed (a point made by Simon Forrest). If we are proposing that humanities and social sciences should be taught alongside health sciences, we may want to take an advocacy stance to first identify who or what our greatest force of resistance would be. This would imply that health professionals should reconceptualise their role from mere providers of medical procedures and assistive devices to advocates of clients and or patients’ rights to access to human rights and the right to be human – even in situations where health professionals need to objectify a body to enable them to perform a procedure. Thinking within our context of South Africa, we remain with the unanswered question: is integrating social sciences and humanities into health science curricula the answer to the challenges experienced within South Africa’s health system? Would integrating social sciences into medical and health sciences curricula conscientize health sciences students to the transformative agenda and the new wave of health reform needed to ensure marginalized and vulnerable populations gain access to equitable services? Would transformation at the wider, societal level, eventually trickle down and foster just medical and rehabilitation schools? We do not yet have answers to this questions, but the workshop pushed us further in our thinking around these issues and the role of education within them. As an organizing team we were blown away by the power of getting 25 people in a room with common interests yet enough disciplinary, geographic and generational differences to spark thought-provoking discussions. In the room were social scientists (mostly anthropologists), medical and rehabilitation clinicians, and medical students. In reality most were hybrids, clinicians with social science qualifications, researchers with clinical backgrounds, students who were also teachers, and social scientists working in faculties of medicine rather than their ‘home’ departments. The geographic spread of the settings under discussion was impressive: South Africa, Canada, France, UK, Iran, Australia, Brazil, Austria, USA, and Switzerland. The workshop was not only inter-cultural, but also inter-generational. Our aim was to bring together participants in early, middle and advanced career stages, and the success of this approach was apparent. We were delighted that our workshop could not only spark new connections between people but also re-connect people with old friends (something we had not anticipated and which re-affirmed what a small world it is!). We believe that the success of the workshop was enhanced by honest reflection on past, current, and future practices within the health sciences while debating the integration or addition of social sciences and humanities as possible contributors towards training a more responsive type of health care professional. We also had the privilege of hearing helpful syntheses and reflections from Hayley MacGregor, Omar Dewachi, Margret Jäger and Todd Meyers, who acted as rapporteurs on day one and two. The workshop sparked a number of questions (some of these questions were not necessarily new ones) and we agreed on keeping space for future collaborations as a way of continuing conversations about how to address the realities of working within bureaucratic systems while retaining and promoting ways of practice that are ‘humanized’. Another contribution to the success of the workshop came down to having a conversation that mattered at a time when health care provision is under the spotlight globally. The gathering took place in the right venue, with the right people, at the right time (harping back to the rules of Open Space!). We would therefore like to formally thank all the participants for coming to Brocher with such thoughtful contributions and for collectively creating a space of generosity, humility and enthusiasm. The programme and report for the sister-workshop held in South Africa are available HERE.